Onam is one of the biggest festivals celebrated in Kerala. This falls on the month of Malayali month of Chingam, which corresponds to date between August and September in the Gregorian calendar. Onam celebrations are observed for ten days and commemorate the homecoming of legendary King Mahabali. Onam is also regarded as the harvest festival of Kerala. King Mahabali is a descendant of King Prahalad, for whom the Lord Vishnu himself incarnated as Lord Narashima. He parts of Kochi, Thrissur, Trivandrum, and Kottayam are the important places of celebrations. Various places across the globe where the Keralites are in huge numbers celebrate Onam. The interesting part of History connects with the incarnation of Lord Vishnu as Vamana, a young child who is just two feet and regarded as Thrikkakara Appan or Onatthappan by Keralites. Kerala was then, ruled by Mahabali, who is a Demon King. During the reign of King Mahabali, Kerala witnessed its golden era. People were happy and prosperous and his subjects highly regarded the king. Despite all the positive qualities, he had one weakness of being “Egoistic.” Lord Vishnu, wanted to teach king Mahabali a lesson, and in the disguise of a young boy, he met the King Mahabali. Onam brings a good flavor and a mix of culture, celebration, and happiness in Kerala. It is also regarded as one of the grand South Indian celebrations. This is also considered as the New Year for Malayalis. Grand celebration of Onam attracts the attention of various tourists across the globe. Kerala Government arranges for a week’s festivities. The elephants are decorated nicely and are set on a procession. Onam connects people with its history and gains enormous importance. 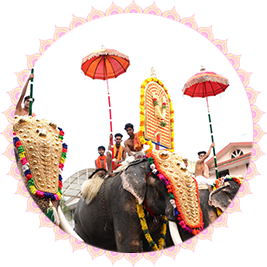 Onam Carnival represents the intricate culture of Kerala. The iconic decorated Pookalam or the floral decorations made of flowers, ambrosial Onasadya or the traditional platter is cooked and served with enormous delicacies. Breathtaking Snake Boat Race and exotic Kaikottikali dance are some of the most remarkable features of Onam. Onam is a colorful event, marked by feasts, folk songs, elegant dances, energetic games, elephants, boats and flowers all are a part of the dynamic festival called Onam. Onakudi is the tradition of wearing a new dress. The ladies of Kerala wear the traditional white saree. Every house is decorated, and the feasts are cooked and shared across the neighborhood. Onam is not only a festival of rich heritage but also the icon of Kerala. It is a symbol of long traditions, which fills India, and proclaims the great flavors through various celebrations.